I wouldn't say the summer has been particularly busy for my husband and me. We have spent most of our weekends doing stuff around the house- you know, all the "little projects" that start out small, but end up taking a lot more time, money, and muscle than orginally you thought they would. Our newest project is our front flower bed. When we moved it, there were three very sad-looking american boxwoods planted in it and that was the extend of the landscaping. We bought 8 beautiful american holly bushes (they look like boxwoods, but these said they do well in shade which is all we have). We planted half of them in the bed, and within a few weeks, they looked as bad as the original three. So, we decided to let the professionals recommend some plants, and we ended up with some beatiful specimens that we are anxious to get planted. When we started digging a few weeks ago, that is when we hit a few snags in the form of bricks, tiles, bottles, chalk, and tree roots. Oh yeah...apparently the builders of our 1954 rancher just buried the excess exterior bricks, kitchen tiles, and their lunches in our front flower bed, and mother nature thought it would be hilarious to add patches of rock-hard chalk to the already difficult to dig in clay that is the "dirt" of our bed. Needless to say, we haven't gotten too far in the digging of our new bed, and now we need to weed out all the debris and enrich the soil with some leaves and soil that our plants might actually want to grow in. Now that I have gotten my semi-rant off my chest, here's a look at what we have been up to lately: Blue Boy at the James River...it is about a mile walk to the river from our house, and on some of these cool nights we have been having in August, we have been taking advantage of our proximity. The pups surprised us, and both of them actually like to get in the river and lay down...even our Miss Priss. 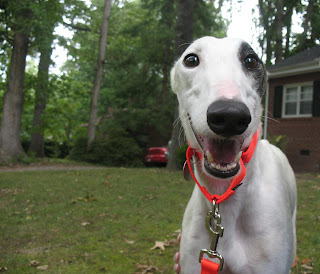 The GPA-Richmond dog haul was on July 26th, and we welcomed 7 new greyhounds to the area! Welcome to the retired life! From this haul, we got our first foster, FS Ghostly Spook. We called her Salem for the short time we had her just because it just sounded wrong to call her Ghostly or Spooky. Unfortunately for us, she was VERY interested in our cats, especially Domino, and we were on deck for keeping her for 10 days or so before her new home was ready for her. Another foster couple was nice enough to drive out to our house on a Sunday to come and pick her up so that our cats could rest easy. Even though she already had a home, even though she was much to focused on the cats, even though we only had her for a day and a half...I loved this little girl. She was very difficult to let go. Trina was smart to give us a foster that already had a home. Salem definitely is one of those greyhounds...like my Annie and my Blue, like Cali, like Lucas, like Booyah, and like all the other countless greys...who are just so special. And you can tell immediately. Such a sweet girl...I hear she has gone to a fantastic family who I know must be spoiling her like crazy right now! How could you resist this face?? Heading to get a bath after coming off the truck. Pulling the pups off the truck. Our friend, Andy, had a birthday at the end of July. We went did a tour of Agecroft Hall (on the list of "things we must do while we live in Richmond, because if we were to move, we probably would never come back to do this"). After the tour, we went to dinner and then came back to Agecroft Hall for a performance of Shakespeare's Henry IV, Part II. We saw Part I for Andy's birthday last year, so it only made sense to see the second to find out how it ends! A view of the house and the gardens. The house actually used to be in England, and in the early 1920s, a family moved the house over here (it was falling to pieces and neglected). The British didn't want it to leave, but they figured it was better to let it go to America than to let it rot in England (smart choice). So, they shipped it over and pieced it back together...actually into a slightly different shape than it used to be in. Melissa and Kenney peeping from the bushes. Some fantastic bird-houses...I want Kenney to make me some like this. Another view of the gardens. This is the stage that they erected for the play later in the evening...here Kenney and Melissa are acting out a scene...from what, I am not sure. We spent a fair amount of time at the start of the summer up in Pennsylvania. Kenney's grandmother had been sick since the start of the year, and his brother, Matt, was stationed in Iraq since shortly after that. Matt came home on leave for 2 weeks, so we drove up to see him and Grammy. We got to spend lots of quality time with both Grammy (she passed away the day after we came back to VA) and Matt (he was able to get his leave extended so he could go to the funeral...now he is back in Farah). 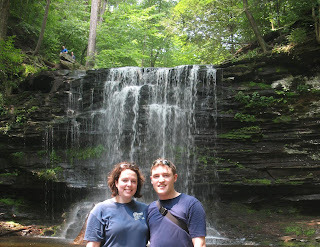 We went hiking in Rickett's Glen...there are tons of amazing waterfalls along the trails. Kenney climbed over so he could walk behind this one. Same falls...but I didn't have good climbing shoes (we are never really prepared when we go to PA). This siblings...(from left to right) Matt, Kenney, Andrea.